Making your home secure doesn’t mean you have to compromise on style and looks. Security doors and security screens come in a variety of colours, shades and styles that not only protect your family but enhance the look of your home as well. In fact, many doors don’t even look as if security is the first priority. Regardless of the materials used, security doors and screens can be made to complement door frames, paintwork and even pavers without compromising on safety. ● Make sure they meet Australian Standards. Look for the sticker, which is the best indication that it lives up to expectations. 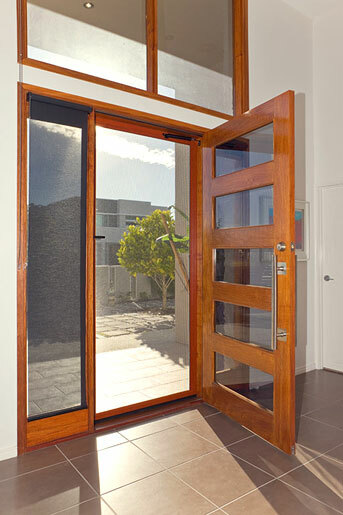 The Australian Standard for hinged and sliding security doors is AS 5039. A door, however, may not have the sticker as manufacturers must pay to use it. Ask if you are not sure. ● The installation also requires an Australian Standard (AS 5040). You should ask for written confirmation that the installation meets this standard. ● Locks should be five pin or have the equivalent cylinder. This makes them stronger. ● The door should have three hinges with fixed pins that cannot be removed. ● The door frame should be reinforced at the corners. ● The door grille should be at least 7mm thick to prevent the door from being kicked in. Rivets or welds that join the grille to the door frame should be no more than 25cm apart. ● The installer should determine if the home’s door frame is strong enough to support the door. If not, reinforcing should be carried out. While the whole point of a security door is to keep you and your property safe, good looks should not be compromised. There are three main types of security doors and each can have a colour and style that complements your home. ● Aluminium: Even though these doors are less susceptible to corrosion, they are still required under Australian Standards to be anodised or powder coated. Aluminium security doors and screens should also be made of tempered aluminium. ● Steel: Just make sure it meets the Australian Standard, which means it will be protected against corrosion. Doors that have been hot-dipped, galvanised or powder coated are the best, especially if you live in the salt air near the sea. ● Stainless steel mesh: Once again, as long as it meets the accepted standard then it is going to do its job well. Unlike steel and aluminium doors, the strength comes from the mesh used rather than a grille. Manufacturers can use different mesh and claims that one is stronger than the other are yet to be independently tested. These types of doors have only come onto the market in recent years but they do have the advantage of creating a cleaner look.